The Celene Jewelry Armoire is more than just a jewelry case; it’s a true statement piece. With its classic finish options, gorgeous mirrored French-style doors and antique hardware and handles, this piece is the perfect addition to any home or apartment. On the top, its hinged lid lifts to reveal a convenient mirror, perfect for doing your makeup. It also boasts handy divided compartments, so you can keep your pieces neat and organized, and the entire armoire is lined with an anti-tarnish felt lining, ensuring your prized possessions are preserved and pristine for as long as you need them. Open the side doors, and you’ll find even more added space, including 16 necklace hooks and 7 spacious pull-out drawers. . There’s so much room in this piece, the options are truly endless. Constructed of wood, metal, and glass. Organizational beauty-tons of storage and a beauty to behold. 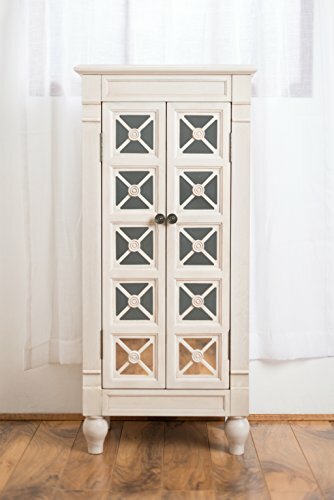 The armoire's height combined with the vanity mirror makes it a perfect partner in your beauty routine.